Have you ever reached way back to the edge of the fridge, searching under the frozen peas and corn to pullout that package of frozen trout. You didn't know it, but you just Hillbilly Hand-fished, sort of. This recreational activity is taking over the country. In fact, it's so popular, signs are going up everywhere to ban this sport. Well, maybe not in New York City. I bet you didn't know that you can actually hire a Hillbilly Hand-fishin guide? Yep, he or she can show you the best location, appropriate technique and dress; yes Hillbilly Hand-fishing has technique just like trout fishing. Think about it, going into Orvis, Cabel's or Bass Pro and shopping for the latest hillbilly handfishin outerwear, overhauls. Believe it or not this is the only "natural way" to catch fish because no bait is used so no animals/worms are harmed,”The all Natural Caught Fish!” In fact, "Hillbilly Handfishin caught fish", may be coming to a health food store near you. Imagine a trip to Whole Foods or Trader Joe's to pick-up some "All Natural Caught Fish" for that important dinner party. Think how impressed your friends will be. Here's the new tag line: Hillbilly Hand-Fish, THE ONLY NATURAL CAUGHT FISH!!! Be lookin for 'em in a store near you! 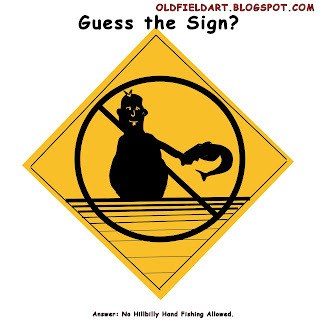 Oh yeah, unfortunately Hillbilly Hand Fishing is frowned upon by some folks as indicated by the sign below. I can’t wait to show tomorrows cartoon, I think it’s just too funny and may be my best! That would be a no noodling sign. People in Oklahoma are big on noodling. Howard over at wind knots just got back from OK and that was the only "fishing" there. Here in Tennesse it's also called noodling. I don't know of many folks that do it, but there are some. 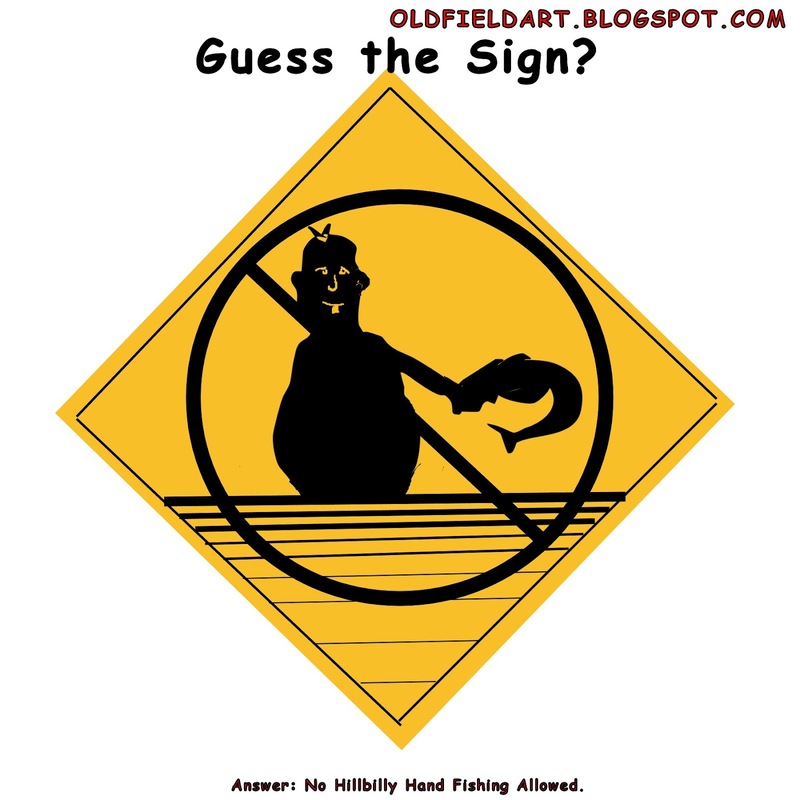 I used Hillbilly Handfishin because of the show on Animal Plant. They must have determined that Hillbilly Handfishin is a much sexier name than noodling.